Dr Lucy Bates models the new scrubs at Westmead Hospital. 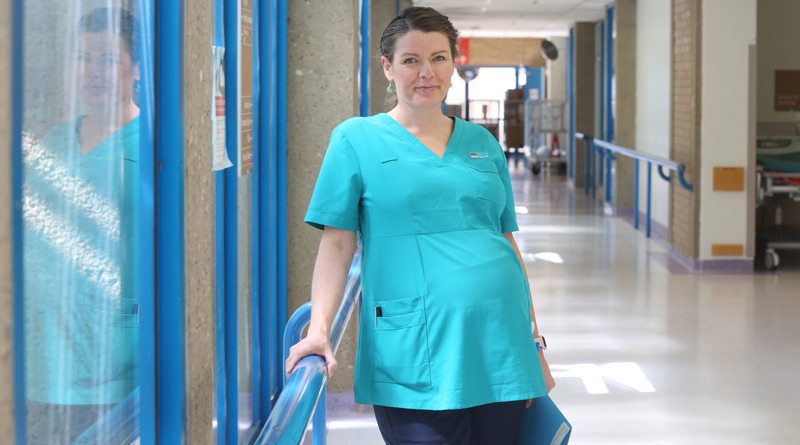 Westmead Hospital’s Dr Lucy Bates was one of the first in NSW to trial NSW Health and NSW Healthshare’s new maternity scrubs for pregnant surgeons and doctors. Dr Bates, who is a urogynaecologist, wore the new scrubs at work before the arrival of her first baby boy – and confirmed they were very comfortable. “The scrubs have been really helpful in a clinical setting and I’m really excited about them,” Dr Bates said. Prior to the introduction of the new scrubs, pregnant doctors wore their own clothes. The request for scrubs for pregnant doctors and surgeons came about when a doctor from Tamworth approached NSW Health Minister Brad Hazzard earlier this year, asking for a maternity uniform to be designed jointly by NSW Health and HealthShare NSW. A NSW Health spokesperson said the scrubs recognises the changing demographic of the health workforce. Lucy’s beautiful boy Charlie was born at Westmead Hospital. The new maternity scrubs are made to order and will be done on a case by case basis. Measurements are entered into an online system that determines the best size. The ordering process takes about 20 days. Lucy and her baby boy Charlie. For more information or to place an order, please contact the HR team at Western Sydney LHD.